This Summer, make your space memorable! When fearlessly introduced, saturated art and decor can create a space full of playful character and personality. Painting your walls a vibrant purple or emerald green, or incorporating a saturated work of art to a room in the house, cleanses the old and awakens your surroundings with new creative energies. 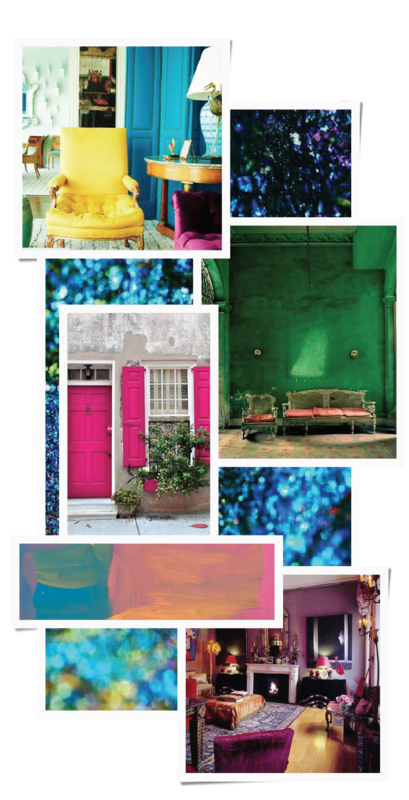 Let go of conventions and paint your world with your favorite & most daring hue. Wolf, “Reunion,” Oil on Canvas, 40 x 40 in. 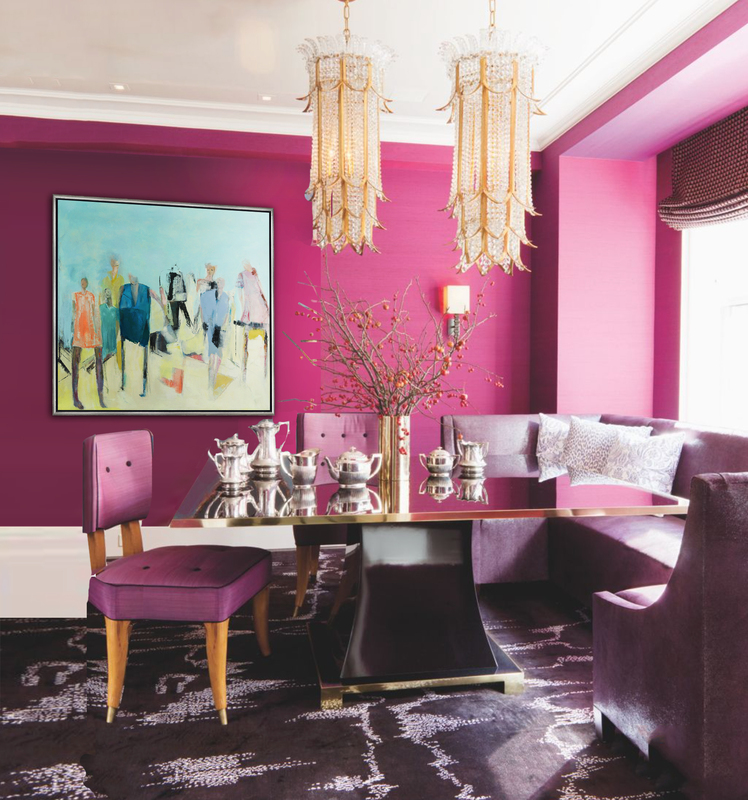 Bright french rose walls meet soft purples and golden accents in this eccentric dining room space. To offset the warm tones, Brigitte Wolf’s “Reunion” offers a cool blue and acid yellow that bring freshness to this opulent setting. Murillo, “Traveler,” Mixed Media with Resin on Wood, 40 x 30 in. Complimentary colors compose this textured interior. 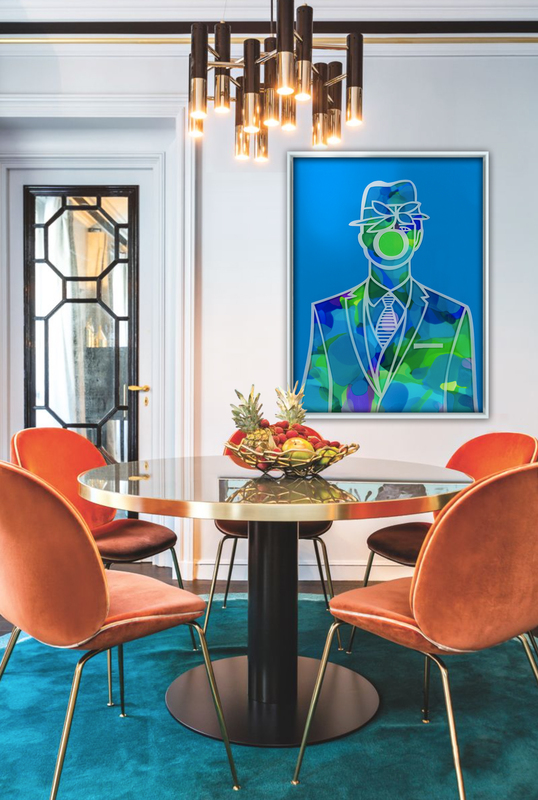 Electric orange velvet chairs sit atop a lush deep teal area rug, its hue mirrored in Alberto Murillo’s “Traveler.” An iconic and bold statement piece for this vibrant space. Weaser, “Foretold,” Mixed Media on Panel, 40 x 80 in. Weaser’s “Foretold” becomes the perfect focal point for this beautiful library haven. 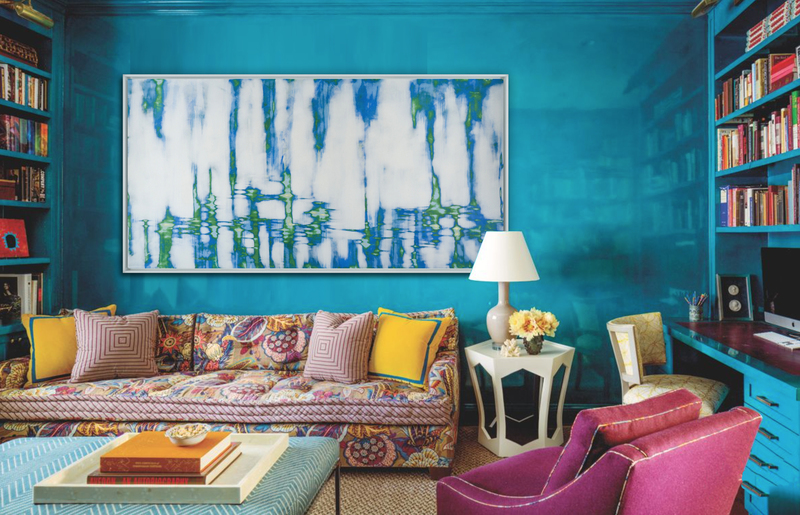 With walls blanketed with rich teal lacquer, the room possesses a jewel box effect. “Foretold” commands one’s attention with its white respite from all the color, while maintaining the hues of its surroundings with cohesion and whimsy.